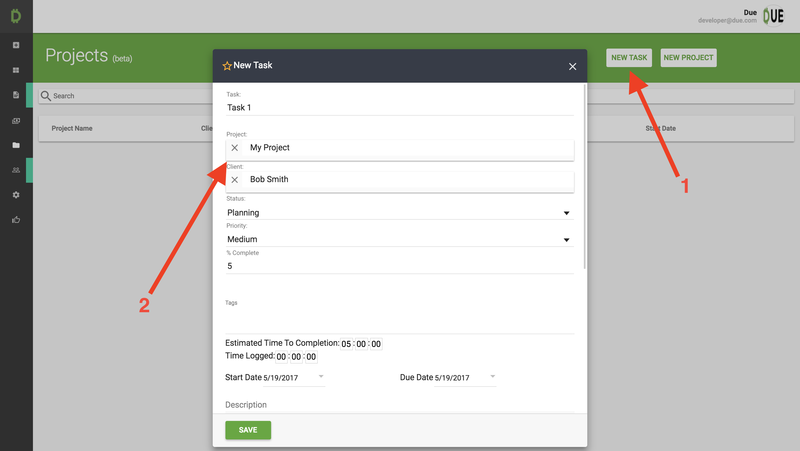 With Due, you can now create projects and track time for certain tasks. This product is currently in beta, so if you have any suggestions or feature requests, feel free to reach out to us at support@due.com. Make sure you’re in the ‘Projects’ tab. Important: You will not be able to add a task without adding a project first. You must select which project the task if for in order to create the task. Give the task a name and then fill in the other required fields. This information can all be edited later on. Once you’ve created a few projects and or tasks, they will all be listed here. Your tasks will be grouped by project and can be easily searched for using the search bar. Click on the timer to start logging time per task. Click here if you’d like to see more options such as edit project or task. Now you know how to use projects and time tracking with Due. If you have any further questions or concerns, feel free to reach out to us directly at support@due.com.